ISBN: 9782211203975 ISBN10: 2211203973. Written by: M Escoffier. Softcover, 29 pp. Take a walk in the savannah and meet a lion who's too hot, a zebra disguised as a lion, a hyena who dresses in ostrich feathers and more strange animals. ISBN: 9782211037266 ISBN10: 2211037267. Written by: Claude Boujon. Softcover, 36 pp. Ratatouille the witch wants to transform herself into a beautiful young girl, but she cant find the right magic potion! ISBN: 9782211078962 ISBN10: 2211078966. Written by: Pierre Bertrand. Softcover, 30 pp.. 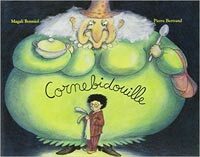 When Pierre will not eat his soup, his father claims that the Cornebidouille witch will come to his room and make him so afraid that he will eat it all. Then one day, she does! ISBN: 9782211063609 ISBN10: 2211063608. Written by: O Lecaye. 40 pp, Hardcover. ISBN: 9782211209472 ISBN10: 2211209475. Written by: Grégoire Solotareff, Nadja. Softcover, 43pp.. Exasperated by all the stories about “little red riding hood,” the “little green riding hood” decides to reveal the truth about what really happened on this famous day when her enemy went to visit her grandmother. ISBN: 9782211201711 ISBN10: 2211201717. Written by: Saint-Exupery. Hardcover, 36 pp. An endearing album which will help younger students discover the magic of Saint-Exupery's universal masterpiece. Abridged original text. ISBN: 9782211064958 ISBN10: 2211064957. Written by: C Valckx. 40 pp. Hardcover.